Life sciences companies need to make better use of the insights that real world data (RWD) can provide in order to improve market access, sales and market growth strategies – and ultimately to improve the applicability of new and existing therapeutics for patients. Insights come not just from the multiple sources of RWD available, but from advanced analytics that highlight the effectiveness of a treatment by geographic area, and link healthcare providers, institutions and patients to relevant and meaningful outcomes. This one-hour event will take a hands-on approach – detailing how insights derived from RWD (and collaboratively with other sources) are enabling all elements of the life science industry to do things better. 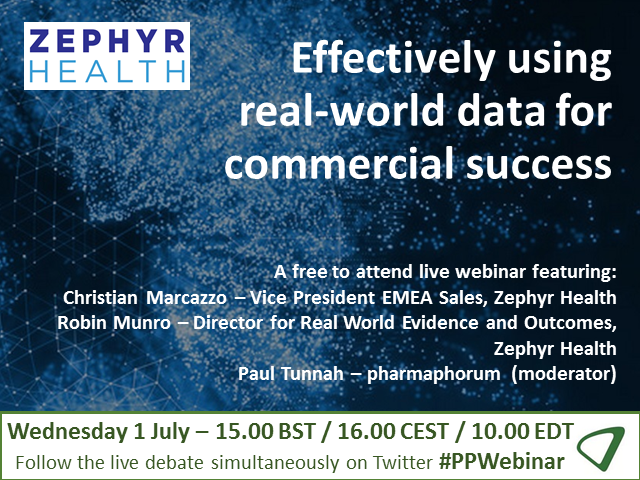 The event will also give an exclusive look at what can be achieved from combining data sources – using Diabetes in England as a case study, Zephyr has implemented novel methods to demonstrate an evidence-based approach to improving information sharing within sales teams and to engaging accounts and payers. We explore how patient outcomes from RWD can add value to commercial strategy.